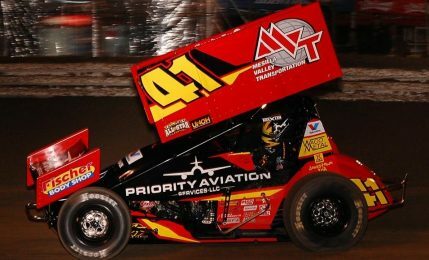 2015 World of Outlaws rookie contender Jason Johnson has suffered a fractured back after a hard crash involving he, Daryn Pittman and Kraig Kinser during Wednesday night’s World of Outlaws Sprint Car Series stop at Placerville Speedway. Johnson, who started 20th in Wednesday night’s A-main, was racing through the field when calamity struck on lap 21, sparking a chain reaction of events where his No. 41 entry flipped on the frontstretch and was impacted hard by both Daryn Pittman and Kraig Kinser. Safety personnel were able to quickly stabilize both Johnson and Pittman, transporting the pair to a local hospital for further evaluation. Johnson’s team later confirmed that the Outlaws rookie sustained a fractured back. Johnson is stable, alert and talking to doctors. Johnson, a five-time Lucas Oil ASCS 360 sprint car champion, was competing in his first full season on the World of Outlaws tour, and was ranked 10th in points following the conclusion of Wednesday night’s event. No timetable has been announced for his return at this time. Pittman was diagnosed with a broken collarbone after the crash and is expected to be out of competition for an undetermined period of time as well. Additional updates will be provided as more information becomes available. Will miss u while not in the PA #41…which can be replaced,the “Rajin Cajun cannot!! Take care, Get Well & know your fans support u!